A duo kit that refreshes the cool blonde and silver tones, featuring brass-busting violet pigments and nourishing agents to keep cool blonde, grey, white and silver hair looking fresh. Let that blonde hair glow with radiance with this duo! 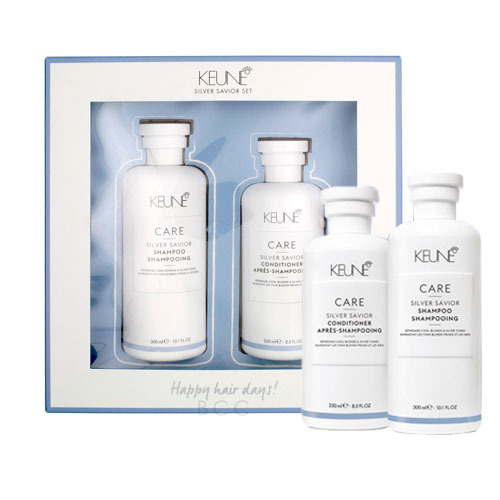 Comes with the Keune CARE Silver Savior shampoo and conditioner to wash and condition the hair while diminishing and neutralizing brassy and warm yellow tones. Both are violet pigmented and nourished with provitamin B5 to leave your hair soft and silky with an enhanced glow.